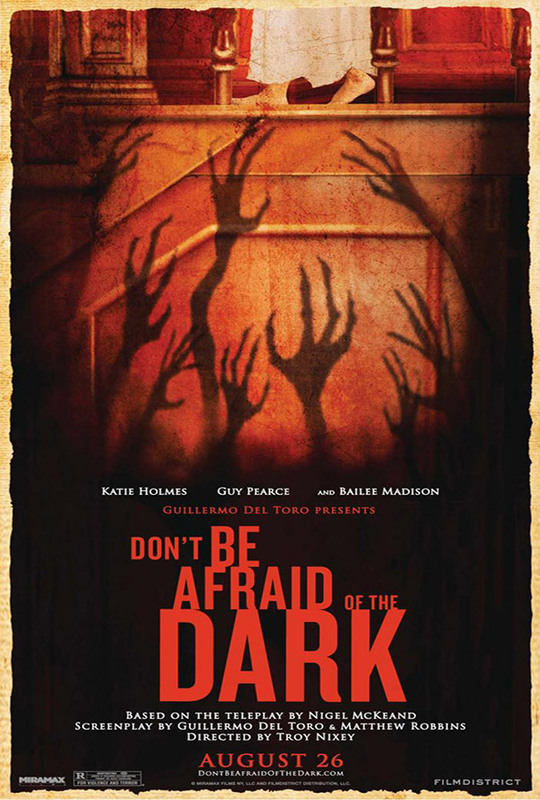 DON’T BE AFRAID OF THE DARK is a moody, atmospheric horror film directed by Troy Nixey and written by Spanish horror veteran, Guillermo Del Toro. Its story is not overly complicated and follows a little girl, Sally, who is pawned off onto her father, Alex (Guy Pearce), and his girlfriend Kim (Katie Holmes), who happen to be living in and renovating an estate with a dark past. As Sally stays with them longer, she beings a spiral into the estate’s dark secrets and history as creatures hidden in the dark want Sally for their own. The film was originally a 1973 made-for-tv movie, and maybe that’s why I found it devoid of serious horror elements, such as anything scary at all. If anything created the eerie, moody tone at all for the film, it was the set pieces. They were successful in laying the groundwork and setting the mood, but unfortunately, there wasn’t much that built upon that groundwork. My main problem with the film was the level of horror associated with the creatures that lurked in the dark. These miniature CGI Gollums would have possibly scared me if I was still 10 years old, but now, I just found them laughable. The “fairies”, as they’re described, eat children’s teeth, and were responsible for children and the original owner/artist of the house disappearing. Every time the film uses a shot from the POV of these fairies or when it shows them attacking someone, I was reminded of PUPPETMASTER, but at least PUPPETMASTER is fun. Overall I didn’t hate the film, but I didn’t love it. It was pretty to watch, but ultimately forgettable. I didn’t care about the characters, and the few secondary characters didn’t get much explanation and just disappeared two thirds into the film. The screenplay, even through written by Del Toro, was lackluster and did not stand out. I expected something scary to happen, and every time there was a big scare moment, I was disappointed. I would have loved DON’T BE AFRAID OF THE DARK if I were 10 years old and could see past the cheesy creatures and mediocre writing, but now as an adult, the film failed at producing any kind of reaction at from me, which is the opposite of what you want from a horror film.